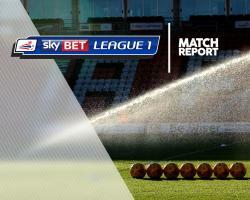 Swindon 3-0 Rochdale- Match Report - Swindon Town MAD! Swindon belied their lowly position by bringing Rochdale's winning streak to a juddering halt with a 3-0 win at the County Ground. First-half strikes form Darnell Furlong and Nathan Delfouneso put Swindon in control before Dale striker Ian Henderson missed a penalty. Joseph Bunney was needlessly sent off for the visitors before Nathan Thompson sealed Swindon's victory. Furlong fired Swindon ahead after 24 minutes when Rochdale failed to clear his free-kick and the defender drifted into the box, where the ball landed at his feet and he finished into the bottom corner. Delfouneso stretched Swindon's lead in the 32nd minute when Conor Thomas's clever pass caught Rochdale square and the former Aston Villa and England Under-21 striker ran clear to calmly slot past Josh Lillis. Rochdale were handed a lifeline 55 seconds into the second half when Johnny Goddard fouled Joe Rafferty but Lawrence Vigouroux saved Henderson's spot-kick. Bunney was sent off in the 72nd minute for an off-the-ball tangle with Furlong, before Thompson completed the scoring by touching in Thomas's free-kick.